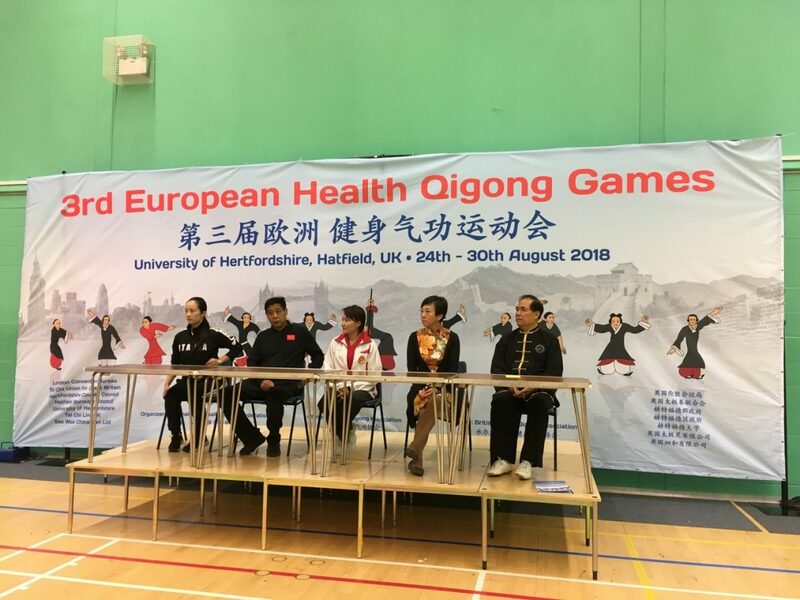 This summer at the University of Hertfordshire a unique event in British history took place when the BHQA hosted the 3rd European Health Qigong Games. This was a coming together of teams and people from around the world to share, experience and compete in this incredible event. There was a full programme on offer starting with two days of Health Qigong training from some of the best teachers in the world. This included a master class in Yi Jin Jing which had those attending lapping up the wonderful experience and knowledge of Professor Shi. All of us had plenty to think about after he had finished with us. Now to put it all into practice! Alongside the master class there were two other sessions (one on each day). The first day was the Daoyin 12 and on the second day the Taiji stick qigong. All sessions were very well attended and the feedback from those who attended was amazing. On the Monday a full day’s symposium was organised to include a wide range of speakers who covered such topics as “Qigong and Mindfulness in the UK School Curriculum” to “Health in Older People – what we know and don’t know”. The Mayor of Hatfield opened proceedings and this was followed by several speeches. Before the first of the lectures we had a large group photo. Unfortunately I was only able to attend the first lecture due to volunteering duties. However it was streamed life online so there is a chance to watch them at leisure. The feedback from those who did attend was very positive. Tuesday was day one of two of the competition. Prior to this we had the opening ceremony which culminated in a mass demonstration of Ba Duan Jin. On day one I was included in the Chi Clinic team – Team Cheam. It was a wonderful privilege to be part of this team and we won the silver cup. This was the first time I had been to a Health Qigong competition and it was so inspiring to see such dedication, support, friendship and encouragement. The performances were incredible and very beautiful to watch. On Wednesday I competed in the Ba Duan Jin individual competition and won bronze. The wonderful thing about these games is that everyone was awarded a medal. All who attended were all winners and a great time was had by all. Next year the World Championships are in Australia. Probably too far to go but in 2020 we will be back in Europe. I’m certainly thinking of attending if only to meet up with this wonderful Qigong family again. Photos can be viewed here and there are a couple of news reports that you can read. The first one can be found here and the second one by clicking here. There is also a wonderful video documenting the journey to the games and the week itself (click on the first video on the left hand side).